A friend expressed the desire to have a “Viking banner”, and so I volunteered to take on that task. As the information is sparse for a quick research task, I designed a more generic banner that would fit in general conventions and styles of 900-1100 Scandinavia rather than a specific time, place, or single culture. The recipient did not have a device registered yet (being new and all), but they were in the process of designing things with the three primary colours (good choice, very striking!). The recipient also expressed the desire to have a raven, which is convenient since Vikings (and Odin) are all about ravens. In Viking cultures, Odin had two ravens, Huginn (“thought”) and Muninn (“memory”), who brought messages to him from around the world of all that they saw and heard. Despite being associated with being covered in the blood of those fallen in battle and other gruesome imagery, early Scandinavians generally regarded ravens as a positive figure because battle and harsh justice were favourable in this period. 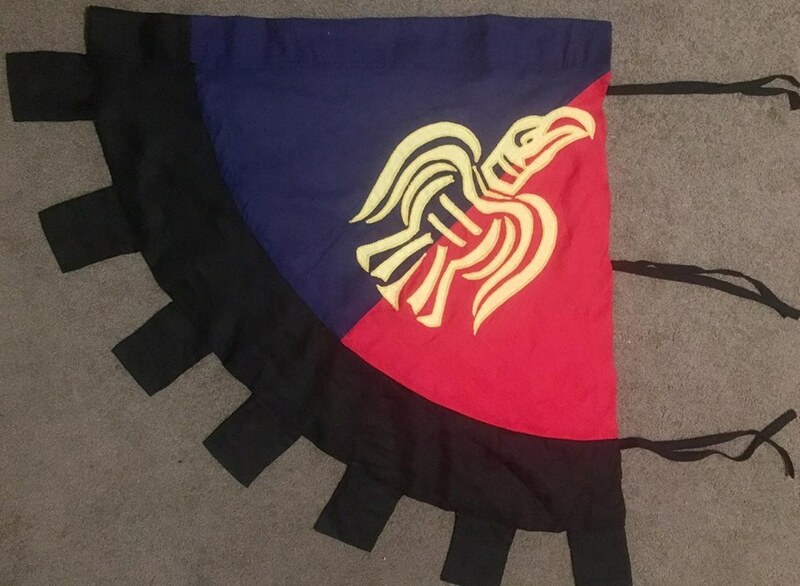 After a little bit of research, I came across an article by the Viking Answer Lady on the famous Raven Banners. According to this article, the Raven Banner was the personal banner of various Viking Chieftains. These banners were probably symbolic of Odin, and a raven depicted as having its beak open, wings beating, and legs restless were symbols of war and victory. In the tenth century, there are two examples of ravens minted on coins by Olaf Cuaran around 940. The first depicts a large raven with its wings displayed (Figure 1), and the other depicts what may be a raven banner (Figure 2). Figure 1: Silver Penny of King Anlaf Guthfrithsson, this 10th century coin depicts a raven with its wings displayed. Source: British Museum, Museum Number 1915,0507.768. The references (see bottom of page) suggest that the banners mentioned in literature are relatively plain in colour and design. The use of colour was possibly quite important to Viking cultures, signalling household allegiances. The most commonly used colours used in household display appear to have been red, yellow, and black. This was a convenient link to the recipients colour choices. The only dubious colour was the blue because it potentially had strong ties with death to some Viking cultures. 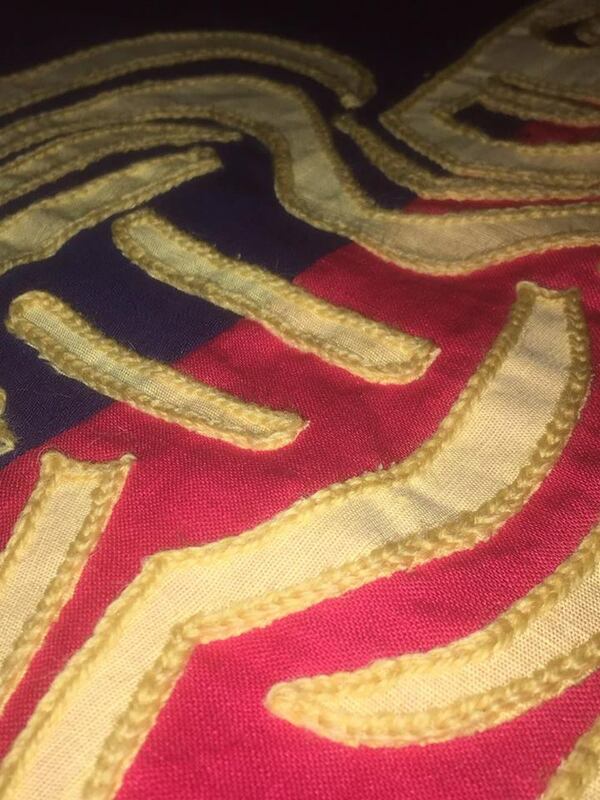 Whilst it was mentioned in the references that plain silk may have been used for banners, I have come across few references to what the banners were made of. Linen was a common fabric used in early Scandinavia and cotton-linen blend is the most readily available linen at the local fabric shop so I opted to use that to make the banner. As the fabric was rather thin, I made an interfacing of thick calico (a natural fibre, and unseen from the outside of the completed banner). Having found zero information on the relative size of these sorts of banners, I chose a size that arbitrarily looked to be a useable size (roughly shoulder-to-shoulder… I have broad shoulders, okay). In terms of how the banners were constructed and decorated, I didn’t really find any solid information on that (I didn’t spend more than a few hours looking into it though so it is quite likely that there may be something out there that I didn’t find). As such, I improvised. I drew a raven in the style of the coin with wings open and beak raised copied from the design on the coin in Figure 1 – a raven of victory is most certainly the best choice for someone who is enthusiastically getting into heavy combat. 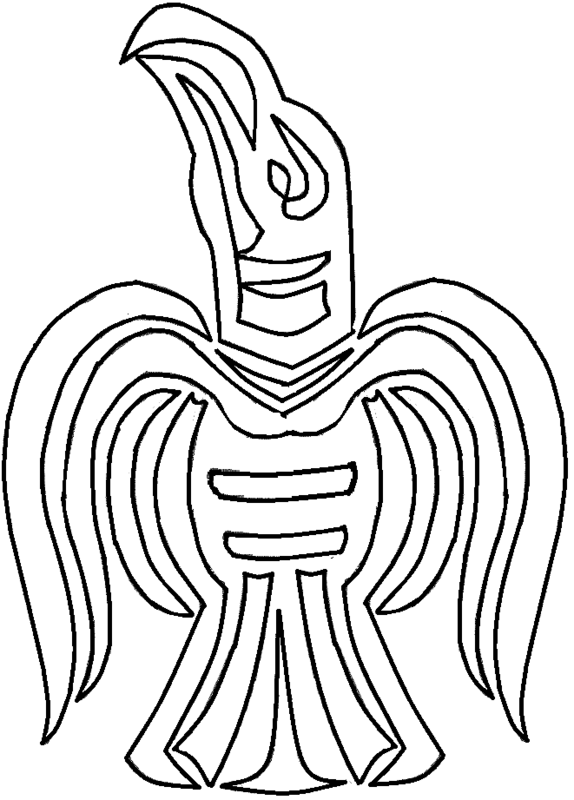 Figure 3: Outline of a displayed Raven, sketched by Ceara Shionnach (2016) from the 10th century coin of King Anlaf Guthfrithsson. I chose red and blue for the background, parti-coloured, and yellow for the raven motif. This was to stay in line with SCA heraldic conventions (no colours on colours or metals on metals) and in line with the design ideas that the recipient was devising at the time for their personal heraldry submission. I decided to go with appliqué outlined in chain stitch for the raven motif. Appliqué was certainly used in decoration on clothing, for example, there is evidence of appliqué in clothing designs found in Birka (Priest-Dorman, 1993). Whilst stem stitch was the more common stitch used for the outline of applique on clothing, I decided to use chain-stitch instead. 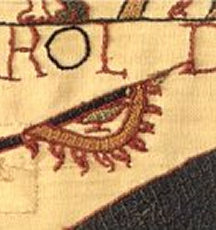 Chain-stitch was certainly found in early Scandinavian embroidery (Priest-Dorman, 1993) and this choice resulted in a thicker outline which looked bolder on the large applique raven, and ensured a large coverage of the edges (to help prevent fraying). The raven motif was drawn onto an iron-on inter-lining (less messy and similar effectiveness to the animal glues used for appliqué) and ironed onto the back of some yellow cotton-linen. Then, in 8-ply yellow, real wool (the only wool available at the store in long lengths) I outlined the entire thing in chain-stitch. As with the example in the Bayeux Tapestry (Figure 4), and the banner depicted on the coin (Figure 2), I wanted to have a different colour along the non-hoist edge of the banner. In order to avoid clashing with the three primary colours, I chose black for the contrasting edge. 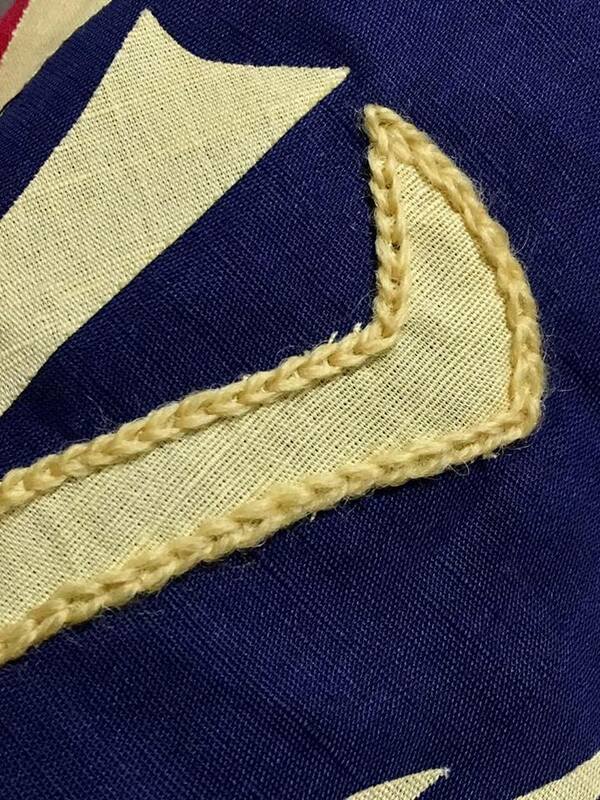 I used whip-stitch as the predominant construction stitch, executed with cotton thread (in lieu of linen thread). This was used because whip-stitch was a commonly-used construction stitch in and around the Viking era (Denmark, Scotland, Hedeby, York, Ireland; shirts, hoods, pouches, etc; 9th-11th centuries – Baker, 2009). This banner took me approximately 50 hours to cut out, sew, applique, and embroider and there is quite a lot of hand-sewing in it (the only machine sewing used was to sew the mid-line join of blue to red, and overlocking some of the edges to prevent fraying). It has a tubular hoist along the top, and three ties along the side to allow various methods for hanging. Figure 5: Chain stitch in progress around the appliqué tail of the raven by Ceara Shionnach (2016). Figure 6: Chain stitch in progress around the appliqué body of the raven by Ceara Shionnach (2016). Baker, Jennifer (2009). Stitches and Seam Techniques Seen on Dark Age/Medieval Garments in Various Museum Collections. The British Museum. Search the Collections. Last accessed December 2016. Priest-Dorman, Carolyn (2000). Personal Display for Viking Age Personae: A Primer for Use in the SCA. Priest-Dorman, Carolyn (2000). Viking Embroidery Stitches and Motifs. Ward, Christie. The Raven Banner and Other Viking Banners. Last accessed 7.12.2016.